GIS Day is celebrated internationally every third Wednesday of November as part of National Geography Awareness Week. It provides an international forum for users of geographic information systems (GIS) technology to demonstrate real-world applications that are making a difference in our society. 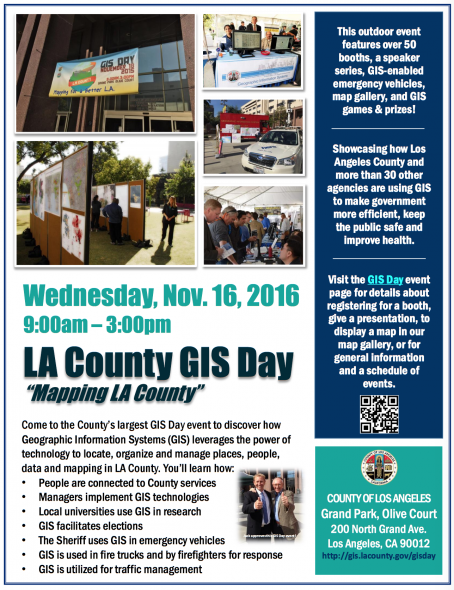 L.A. County GIS Day will be held at Grand Park on Nov. 16. from 9 a.m. to 3 p.m. Drop by to learn more about how the county, government agencies, private companies, educational institutions, and non-profit organizations use GIS in emergency response, social services and administration to make life better in Los Angeles County. To get to Grand Park, take the Red or Purple Line to Civic Center/Grand Park Station. There are also multiple bus lines serving the area, as well as Metro Bike Share.